Looking for some magic and sparkle? Well, you've come to the right place! We have fantastical art, magical journals, and very sparkly jewelry, all created just for you. If you've seen us at a show lately and saw something you don't see here, please email us, it might still be here just not up yet. I, Apryl Miller, am the face behind the business, nice to meet you! I create intuitive jewelry designs, working with the energy of the stones, chakras, and whatever else draws me at the time. Many of my pieces are inspired by Goddesses, myths, or healing concepts. I came into working with stones after many years in the creative business. I grew up in a small business, stocking shelves, painting display items (ceramics and wooden items) and even teaching classes before and through high school. After many years and many experiments in different creative forms, I found beadwork and jewelry making and fell in love. Since my husband, Nathan, was injured I've taken over the business as well, learning his top secret techniques for journals and such and now work with prints of his paintings to create even more. We also have Nathan Miller, the face behind the ink. 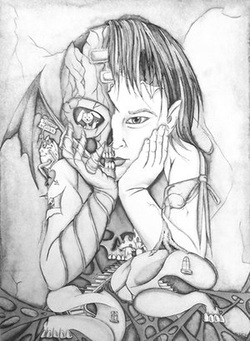 Nate's been drawing and painting since childhood, exploring many genres and mediums. He has joked that it was all he could do during the many, many times he was in trouble as a kid. He has always been most drawn to fantasy and faeries, with a bit of the dark side. Luckily for me, he has always been a VERY prolific artist, which is great, since due to injury (3rd time herniating his lower back, this time was unfixable) he has been unable to join me here in creating for the last few years. But I have a LARGE stack of paintings and drawings of his to add in as I can to the galleries on here.